For contributor guidelines, scroll down. Elen Turner is a travel writer, editor, and consultant who divides her time between Nepal and New Zealand. Her writing about Nepal, India, and further afield has been widely published in magazines and on websites. Find her at elenturner.com and on Instagram @eleninthewilderness. Ideal day in Kathmandu: If you're not staying in Patan, get over there immediately! Start with a coffee at the the Himayalan Java coffee shop just around the corner from Patan Durbar Square, which looks out over a golden Buddha statue. Then, take in the beauty of the Durbar Square, and check out the excellent Patan Museum, which gives a crash course in Nepali architecture of the Kathmandu Valley. Have lunch either at a hole-in-the-wall around the square, or somewhere a little more upmarket, like Cafe Swotha or Of Silk & Salt. In the afternoon, take a taxi over to Swayambhunath (aka the Monkey Temple) for sweeping valley views and a laugh with the monkeys (just don't feed them!). In the evening, have dinner and drinks at Durbar Marg (more upmarket) or Thamel (backpacker vibe). Calling Hobart home for more than 10 years, Andrew and Karen are two traveling foodies who love to get off the tourist trail, seeking out authentic, local dishes that make their taste buds sing. Join them at Fork + Foot as they continue their never-ending quest for the world's best street food! You can follow Michael on Instagram to check out his latest culinary and other adventures. Ideal day in Beijing: Start off by wolfing down a freshly grilled jianbing at the breakfast stand down the street, then beat the crowds with a morning trip to check out the latest art installation at 798. For lunch, head to Li Ji for chuanr and shaobing, then hop over to Houhai for a stroll (or maybe a quick swim). Cool off with the locals with an Arctic Ocean orange soda or a creamy binggun Popsicle, then join the expat crowd for a microbrew in the courtyard bar at Great Leap. Hop on a Mobike to cycle home, with a quick detour to enjoy the lit-up buildings along Chang’an Avenue. A Bay Area native and a San Francisco resident, with a tendency toward prolonged stints in Philadelphia, Brooklyn, and Istanbul, Lauren Sloss writes about food, music, and adventures, and indulges in all three as often as possible. Say hey and follow Lauren @laurensloss. Ideal day in San Francisco: Start with an almond latte and toast at The Mill. Bike out to the ocean; bike back to the Mission for a Dolores Park hang, including burritos and beers. Cruise to the Ferry Building for oysters and bubbly on the Bay. Meet friends for cocktails, followed by an amazing dinner with wine, and a dance party to work it all off. Photo-booth photo shoots ensue. Repeat! Mona Polo is a Manila girl to the core, though she is currently based in Cebu tending to the sailing apparel line Blood Red. In Philippine lore, a mole on the sole of the foot is a sign of wanderlust—she has two moles under her left foot. She has produced documentaries, travel videos, a magazine, and off-the-wall events before settling in as a writer for hire. She takes photographs when coerced encouraged. Ideal day in Cebu: Go to a deli (Tinderbox) or supermarket (Rustan’s Fresh) for cooler supplies: fruit juice, beer, water, and ice, plus freshly baked bread, cheese, carrots, cucumbers, and ham. Stop for some roadside lechon manok, puso, fresh mangoes, watermelons, and other fruits in season. Get to a pier, hire a banca (an outrigger pumpboat), and go island-hopping: Hit Pandanon Island, Sulpa, Hilutungan. Swim. Eat. Snorkel. Eat. Lounge. Eat. Sunbathe. Repeat til sundown. Ideal day in Manila: Meet friends for brunch at Café Adriatico, and linger over coffee and suman. Escape the heat and pollution by hitting The Metropolitan Museum for ancient Filipino gold or The National Museum for the jaw-dropping Spolarium and Philippine artifacts. Spot vendors hawking buko, kwek-kwek, camote cue, etc. while crossing through Rizal Park (Luneta) for pancit canton at Amber’s. Or, head over to Intramuros for a bambike ecotour and stop at The Manila Collectible for hand-crafted souvenirs, local munchies, and liquor for pasalubong. Rush to the Bayleaf Hotel’s Sky Deck for a sundowner to toast the famed Manila Bay sunset. Order dinner from the Heritage page, and save room for leche flan and halo-halo. **As of Jan. 2019, we are no longer seeking freelance contributions. Check back in a few months! 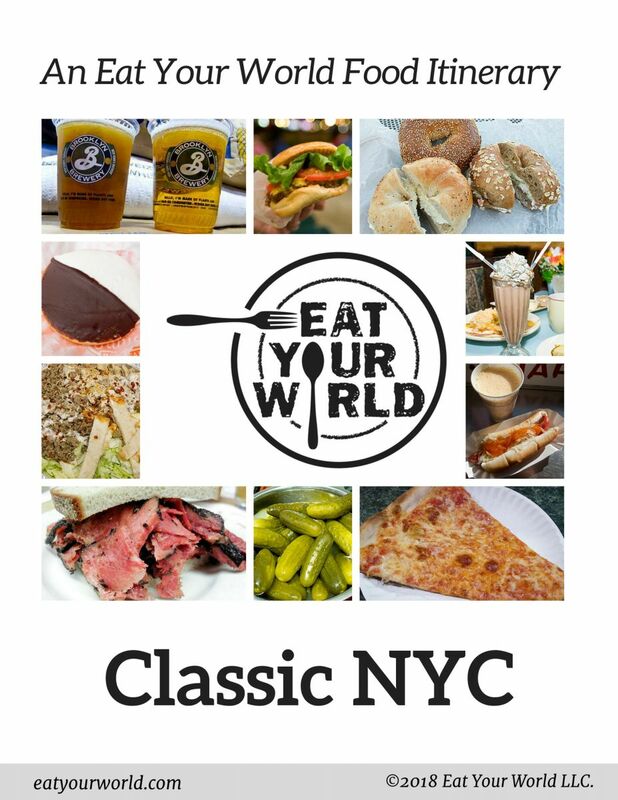 For the EYW Blog: Eat Your World is looking for a few hungry food/travel writers to work with. Pitches can be sent to [email protected]. Please note whether you have original photos as well. For EYW destination guides: Do you live in a city you don't see covered on EYW, and know the food scene in and out? Are you a writer who fancies yourself a good photographer too? Pitch us a new destination guide: well-researched entries for What to Eat, How to Burn It Off, Where to Stay, plus an introduction and high-quality photos. This is a paid gig ($300-$400), based on how many food entries are to be completed. Please contact [email protected] to introduce yourself, your city, and your work if you’re interested. As always, we encourage you to get involved by uploading your own regional-food photos and writing your favorite food-related memories. If you impress us with your own coverage, we may hire you to help with ours!